Christopher Marlowe, and Thomas Nash. Gent. Played by the Children of her Maiesties Chappell. ... Actors [in double columns] Iupiter. Ascanius. | Ganimed. Dido. | Venus. Anna. | Cupid. Achates. | Iuno. Ilioneus. | [following character fills two lines in column 1] Mercurie, or Hermes. Iarbas. | Cloanthes. | Æneas. Sergestus. AT LONDON, Printed, by the Widdowe Orwin, for Thomas Woodcocke, and are to be solde at his shop, in Paules Church-yeard, at the signe of the blacke Beare. 1594. 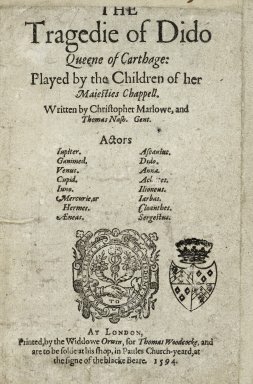 Title page imaged from Folger call number: STC 17441. Image is not from the transcribed copy.